*By which we mean the food of the Levant**, but we said Middle Eastern to draw you in. **It’s really Lebanese food that we are talking about, but we don’t want to alienate Syrians and Palestinians. There could be no doubt that Levantine cuisine is the greatest in the world, but few people know that it is the product of centuries of ideological conflict, philosophical debates and conceptual disagreements that have often pitted brother against brother and mother against daughter. Before it crystallised into its current form we all love and enjoy, it went through epochs of internecine struggles that the field of food theory has never witnessed the likes off before or since. Here is the fascinating story of how the beloved tabbouleh acquired its current form and why kibbeh looks like a rugby ball. Much like any Lebanese meal, it all begins with hummus. If you don’t know what hummus is, it’s a dish made of chickpeas… hang on, if you don’t know what hummus is, what are you doing reading this? At the end of the third millennium BC a revolution in the consumption of chickpeas occurred in Mesopotamia, in the Akkadian empire to be specific. 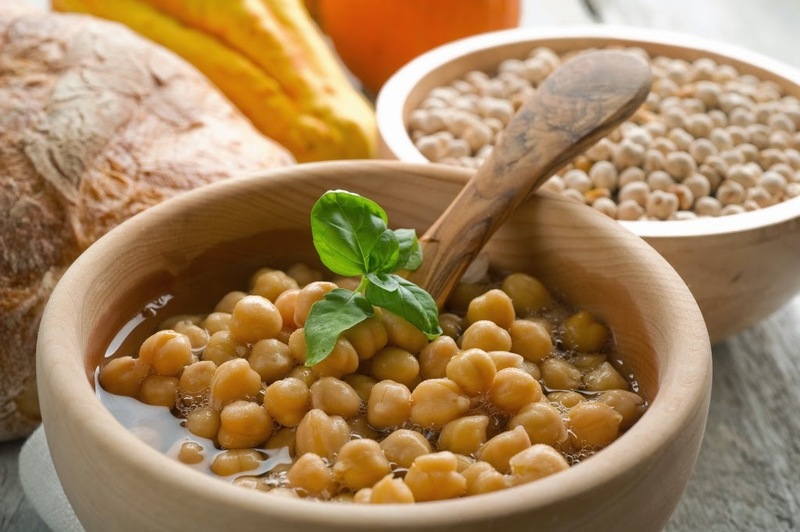 For centuries people were used to eating chickpeas whole, until someone thought to mash them and add some olive oil. Our second course, if you excuse the pun, is the tabbouleh, the ‘princess of all salads’ as renowned Lebanese al-Nahda thinker Jameel al-Bustani called it. 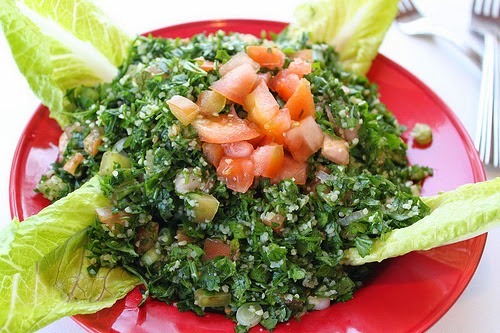 Tabbouleh was crucial to the formation of a new Levantine identity under Ottoman rule, exploiting the Ottomans’ weakness when it came to salads despite their otherwise impeccable culinary achievements. To this day, Turkish salads remain half-hearted attempts at mixing vegetables unconvincingly. But I digress. The conflict raged on for centuries and has not been resolved until today. One of the most difficult questions to answer in a Lebanese restaurant is ‘tabbouleh or fattoush?’ Whichever one chooses, the legacy of the historic conflict is always there. Attempts at reconciliation by ordering both are considered bad form. However, the major food conflict in the 18th century was sparked off by Napoleon’s campaigns in the Levant. The rationalist emperor was incensed by the locals’ way of serving mezzeh dishes haphazardly with no clear order or sequence. As he wrote in one of his letters to his wife: “sometimes the hummus comes first, sometimes the tabbouleh, and one is lost for he does not know what to expect. I miss you very much.” The chaotic way of serving food as it became ready was an affront to the Emperor’s Enlightenment values, and he thought that his attempt to modernise the Levant had to start with altering this non-linear way of serving food. The pamphlet enraged locals from Syria to Lebanon to Palestine. Local circles were formed to organise opposition to Napoleon’s draconian reforms, and civic disobedience followed. Extremists took to eating their dessert first but they were criticised for being unnecessarily dramatic. Amidst the turmoil, a group of Lebanese thinkers influenced by European ideas yet keen to emphasise their own identity, found a compromise. The meal would begin with the mezzeh, but then progress to the main course and later fruits and desserts. As a result, people eating Lebanese food to this day still find that they are too full when the main course, usually grilled meat, arrives, but they are too shy to admit it so they try to force down a few morsels. And much like any decent Levantine meal, we end with the dessert. It is here that the legacy of the different cultures and peoples that have inhabited the Levant come together in a superb display of mastering the art of satisfying the sweet tooth. But even here the field is not without its own history of controversy. 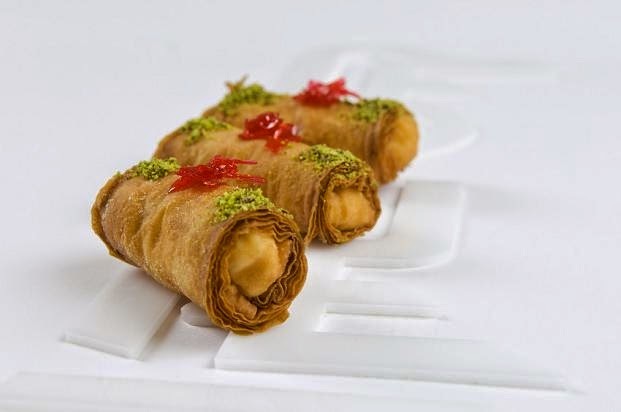 The main conflict is between the epicureans and conservative religious puritans who objected on principle to Arab sweetened pastries as ‘the ultimate form of temptation’. The leading critic of Arab desserts was the scholar al-Maryouffi who saw Arab pastry as a symbol of the decadence of the royal courts and the subsequent decline of Islamic culture. He also waged a war against the ‘unnecessary euphemisms’ implied by the names of desserts such as znoud el sett (the forearms of the lady), which to his mind clearly indicated their role as instruments of temptation, mixing gluttony with sexual desire. “The way the layers of pastry crush against the cream filling, oozing the rosewater sugar over one’s tongue… is nothing short of a sin. Many a man of weak-faith says ‘this is heavenly’, adding blasphemy to this excess, this temptation should be resisted by every good believer.” Al-Maryouffi said in a famous text on the subject. Reformers hit back against al-Maryouffi and his rigid interpretation of religion and the strength of human will. The conflict escalated into a full philosophical confrontation that drew in wide circles of scholars and philosophers, and putting the question of dessert at the heart of the theological battle over human will. The continuing popularity of Arab desserts suggests that the majority of people were convinced by the reformers in a definite philosophical victory.